Metal Detector used at every security point; Factory gate, Appartment Gate, for checking any wepon Knife, gun, theft, any metal can be detected . 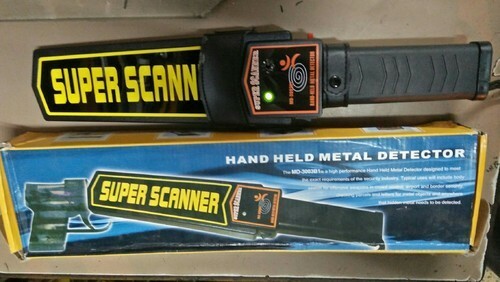 Metal Detector used at every security point; Factory gate, Appartment Gate, for checking any wepon Knife,gun, theft,any metal can be detected . We started in the year 1995, by the name of Mehta Associates. The company is a leading manufacturer, supplier, Trader, exporter and importer of Drill Sharpener, End Mill Sharpener, Tap Sharpener, Road Measure, Torque Multiplier, Tool Kit and many more. Our spare parts are sourced from credible and reliable vendors to ensure safe operations of the machinery. A very spacious warehouse is also an important asset of our entity. Owing to the expert guidance of Mr. Rakesh Mehta (Proprietor) and the joint efforts of our team, we have been able to gain the trust of our esteemed clients and a strong foothold in the market. Our group of directors has in-depth industry knowledge and a complete exposure in the domain and hence they are able to lead the organization efficiently. Preferred Location: Assam, Bihar, Orissa, Jharkhand.